The Shoalhaven River was a continual source of inspiration to Arthur Boyd and, looking back over the artist’s vast body of work, formed a major part of Boyd’s oeuvre. The Shoalhaven region on the south coast of New South Wales, has historically been an area favoured by artists because of its unique geography and landscape. The area is known for its lush green dairy farms, white sandy beaches and the majestic Shoalhaven River which snakes its way past Bundanon, the Boyd family’s property. 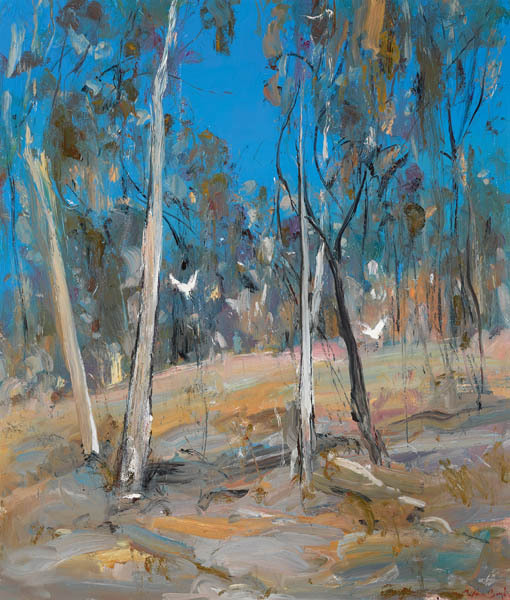 The present work, Shoalhaven Bush Landscape, deftly conveys the character of the country surrounding Bundanon - Boyd’s palette is dominated by ultramarines, whites and browns which were used by the artist when rendering the landscape in full daylight. The artist skilfully captures the heat of the day with his depiction of a clear, cloudless blue sky. Slender gumtrees populate the arid hillside, their diminished canopies providing the only shade for flora and fauna nearby. Here, Boyd has distilled the unique characteristics of this captivating setting; through his arrangement of compositional elements and a mastery of tone and colour, the artist demonstrates his deep understanding of, and admiration for, this special place.